The city of Berlin is taking extra precautions to protect female New Year’s Eve celebrants this year because of the fear of another wave of rapes by the Muslim refugees. During the 2015/2016 New Year’s Eve celebrations in Germany, there was a barrage of sexual assaults, 24 rapes, in Cologne. There were similar incidents at the public celebrations in Hamburg, Dortmund, Düsseldorf, Stuttgart, and Bielefeld. Throughout Germany, police reported, that 1,200 women were sexually assaulted and estimate that at least 2,000 men were involved, acting in gangs. 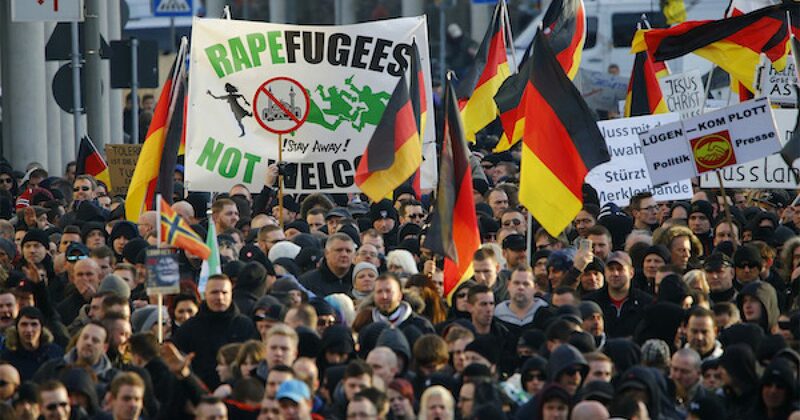 The incidents involved women being surrounded and assaulted by groups of men on the street Police reported that the perpetrators were men of “Arab or North African appearance” and said that Germany had never experienced such mass sexual assaults before. Last year, there were still assaults throughout the country but thankfully not as many 2015/2016. Up to a million guests are expected to attend the open-air event taking place around Berlin’s iconic Brandenburg Gate, featuring fireworks and pop acts such as Rednex and Whigfield this year. “There will be three to four (German Red Cross) helpers who are specially trained and can look after women who feel harassed or threatened,” a spokesperson for the celebrations, Anja Marx, told German national broadcaster rbb. A police spokesperson told The Telegraph that patrolling authorities planned to check in regularly with staff at the women’s safety tent and tend to instances of criminal offence. Hundreds of women reported sexual attacks and robberies by men outside the main train station at Cologne’s public New Year’s Eve gathering in 2016, where law enforcement was heavily outnumbered by dense crowds. Suspects were largely of North African and Arab background. The incident happened after Germany had accepted a record influx of more than one million migrants in 2015, mostly people fleeing conflict and poverty in the Middle East and elsewhere. On one hand, it’s great that Berlin is taking extra precautions. On the other hand, it should serve as a warning to the liberals in the U.S. who run to the 9th Circut Court to stop President Trump’s vetting program. The horrors that have been seen in Germany and other countries such as Sweden are a direct result of allowing a deluge of refugees into their countries without prior vetting. I do not believe we should stop Muslims from coming into the country, that is un-American, but I do believe we should check out everybody who comes here, and if they come from a country with lousy vetting, or terrorist entities we should check them out two or three times before they are allowed here. Without that stringent vetting, we can’t know who is coming into the United States and what happened in Germany two years ago may happen here two years from now.